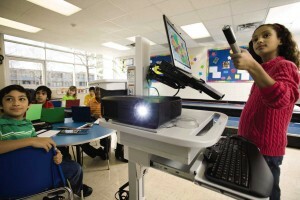 Keep a healthy classroom when using a projector. 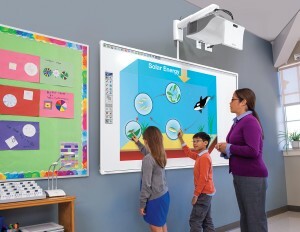 Learn how to keep a healthy classroom when using a projector. You may be using a traditional data projector on a table, a short throw projector mounted on the ceiling or a rear-projection whiteboard. Despite the type of projector being used, there are still important safety conditions that should be followed. You want to maintain a healthy classroom that is safe for both you and your students. Projectors operate under using high intensity light and direct exposure can damage your retinas. While we do come equipped with an aversion reflex that makes us automatically turn away from the bright light, there is still a danger of peripheral overexposure. Always encourage your students to get into the routine of walking up to the whiteboard outside of the beam and using it with their back to the class. There is no risk when standing outside the beam while facing the projector. Even looking outside the projector beam is dangerous since our automatic aversion response doesn’t kick in thereby making it easier to stare at the light. It’s similar to staring onto the sun and experiencing overexposure to UV light. Symptoms of eyestrain include feelings of burning, inflammation and sensitivity originating in the cornea. There is no risk to the eye standing outside the beam when facing in the direction of the projector. The recommended maximum exposure limit is currently set at 10-20 seconds. A warning notice should be displayed prominently reminding students not to stare into the projector beam. Look for a projector that has a built in brightness adjustment or neutral density option. This can help reduce the light that leaks out the side of the projector. Some DLP projectors have a subtle rainbow banding effect that appears when you move your eyes side to side. This rainbow effect can cause eyestrain. Go for a 3-chip DLP to reduce the rainbow without having to produce more light. You may want to consider a short-throw projector that can throw a large image in tight spaces and minimize the risk of people getting in front of the light beam. Most short-throw projectors need 3 to 6 feet while the ultra-short-throw projectors need only a few inches. A ceiling mounted projector is the preferred position to reduce exposure to the light beam. Ultra-short throw projectors can also be mounted just above the screen thereby making it impossible to stare into the beam. Use blinds in a bright room rather than increasing the brightness of the projector. Black out curtains can stop any glare on the screen and also reduce the need for intense lighting. A remote control device is also a good way to keep the user out of the projector beam. Another important consideration is the type of lamp used inside the projector. Genuine OEM PHILIPS projector lamps use UV coated reflectors allowing for a brighter and more vibrant picture. These reflectors reduce the harmful rays coming out of the projector and any possible eye damage. Counterfeit lamps have non-coated reflectors that allow the dangerous rays to be spread out into the classroom. Authentic projector lamps keep your classroom safer.